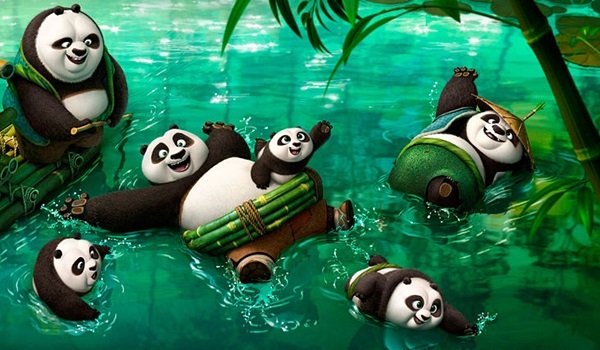 Kung Fu Panda 3 appears set for an impressive first place debut this weekend. The 3D computer animated sequel from Fox and DreamWorks Animation is generating strong online pre-sales heading into the weekend and will have the family marketplace largely to itself this weekend (and for all of February as well). BoxOffice expects Kung Fu Panda 3 to deliver the second largest January launch of all time (behind only American Sniper). Also opening in wide release this weekend are Disney's The Finest Hours and Open Road's Fifty Shades of Black. BoxOffice doesn't expect much from either film, but feels that The Finest Hours should have the slight edge between the two thanks in part to a significantly larger location count and higher priced 3D and IMAX admissions. Look for both films to finish behind Fox's The Revenant and Disney's Star Wars: The Force Awakens in this weekend's rankings. - Fandango is reporting today that Kung Fu Panda 3 is "outpacing DreamWorks Animation's previous hits, Home and Kung Fu Panda 2 at the same point in the Fandango sales cycle." - Early reviews for Kung Fu Panda 3 are strong. The film currently boasts an 89 percent Tomatometer on Rotten Tomatoes. - While it fell off significantly from its predecessor, 2011's Kung Fu Panda 2 still finished its domestic run with $165.2 million and was well received by audiences and critics alike. - The film's late January release date is very similar to the early February release dates of 2014's The Lego Movie and last year's The SpongeBob Movie: Sponge Out of Water, both of which greatly exceeded expectations. - As mentioned, Kung Fu Panda 3 will have the family marketplace pretty much to itself this weekend. Family audiences on the East Coast may also be especially in the mood for the film this weekend after being snowed in last weekend. - While Kung Fu Panda 3 has performed well in general on Twitter, it has been displaying some relative slowing in the days leading up to its release. That is a bit concerning, especially given that the film's expected overseas strength could be inflating online activity in general as well. - It's possible that the lack of family films on the February release slate could lead to opening weekend demand for the film being lowered a bit, as family audiences will have plenty of time to catch the film at a later point. - The Finest Hours features a stellar cast that includes Chris Pine, Casey Affleck, Ben Foster and Eric Bana. - In the battle with Fifty Shades of Black this weekend, The Finest Hours will have the advantages of a significantly higher location count and of higher priced 3D and IMAX admissions. - The Finest Hours has been performing very softly on Twitter in the weeks leading up to its release. - Early critical reviews for The Finest Hours are mixed. The film currently has a Tomatometer of just 53 percent on Rotten Tomatoes. - A disaster film set at sea in the 1950s is unlikely to catch the attention of audiences, especially with the recent disappointing performance of Warner's In the Heart of the Sea in mind. - Marlon Wayans experienced a career resurgence with 2013's A Haunted House, which opened with $18.1 million and finished with $40.0 million domestically. - In the battle with The Finest Hours this weekend, Fifty Shades of Black will have the initial advantage of likely being much more front-loaded towards opening weekend. - 2014's A Haunted House 2 disappointed with an $8.8 million debut and $17.3 million total domestic gross. A performance similar to A Haunted House 2 is feeling much more likely for Fifty Shades of Black rather than a performance similar to A Haunted House. - Fifty Shades of Black has been performing softly on Twitter, especially in comparison to the Twitter activity levels of both A Haunted House films. - In general, parodies aren't anywhere near as popular now as they were in the previous decade. BoxOffice projects this weekend's top ten films will total $121.1 million. That would represent an impressive 51.2 percent increase over the $80.1 million top ten total of the same weekend last year, though it should be noted that weekend was Super Bowl weekend. That weekend was led by the $30.7 million grossed by Warner's American Sniper during its third weekend of wide release and saw soft starts by Paramount's Project Almanac ($8.3 million), Relativity's Black or White ($6.2 million) and Open Road's The Loft ($2.7 million).